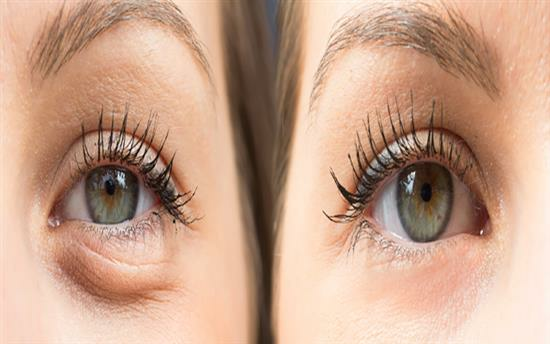 When the lower eyelids begin to age they can form the appearance of under-eye bags with loose skin and fine wrinkles. The different components of ageing are each addressed by a specific surgical technique or combination of techniques. There is a very effective surgical procedure to correct the appearance of eye bags called blepharoplasty. The surgical blepharoplasty addresses the excess fat and loose skin. The excess fat is removed and the excess skin is either trimmed or re-positioned. However, some patients may not have very prominent signs of excess fat and loose skin and a full blepharoplasty may not be warranted. In these situations, fractional laser resurfacing of the lower eyelid can have considerable benefits in tightening the mildly lax skin. Occasionally if there are ‘fat bags’ without too much loose skin then the fat can be trimmed from the inside of the lower eyelid leaving no external scar and the external skin can be treated with fractional laser. This is a combination technique which uses a trans-conjunctival fat removal or re-positioning of fat combined with external laser resurfacing. The procedure can be carried out under local anaesthetic. During the procedure, the eye itself is protected with a shield to prevent the laser beam from coming into contact with deeper structures. The procedure takes approximately 20 minutes during which the laser beam is carefully passed over the lower eyelid skin. The skin is then covered with a topical antibiotic ointment. If the procedure is combined with a surgical technique to address the fat bulges then usually a general anaesthetic is required but it is still performed as a day case procedure. You will experience some redness, scabs and moist areas for approximately two weeks. The skin simply needs to be kept moisturised during the healing phase with an antibiotic based gel which will be prescribed. After the initial two weeks, some makeup can be applied. It will usually take approximately three months to see the best results. Very occasionally a second treatment session may be required. Can the procedure be combined with other facial surgery? It is very common to combine this procedure with other facial surgery such as facelift surgery, upper blepharoplasty or brow lifts. In these situations, a general anaesthetic is required.